A new exhibition explores the meanings of the 1982 suicide bombing at the Wanganui Computer Centre in New Zealand. Just after midnight, Neil Roberts painted a quote on the wall of a toilet block: “We have maintained a silence closely resembling stupidity.” He also painted an anarchist symbol and the words “peace thinking”. Roberts then walked towards the Computer Centre that stored criminal and justice information for use by New Zealand law enforcement agencies. One of two security guards inside the foyer of the centre saw him coming and reached for the intercom. He saw Roberts bend down as if to tie his shoes. A deafening roar and a flash followed as six sticks of gelignite in a red hold-all Roberts was carrying exploded. The security guards were blown off their feet but uninjured. The entrance foyer was wrecked. At the age of 22, Roberts was gone, but the Sperry Univac 1000 computers inside kept humming. Up to 150 people worked at the Wanganui Computer Centre, but there were only seven on duty at that time of the morning on 18 November 1982. They were evacuated through the back of the building away from the gory scene in front. Superintendent B. K. Dean said he had never before seen a body so mangled. “They will be finding bits of him for days,” he said. A piece of Roberts’ chest was found bearing the tattoo “This punk won’t see 23, no future”. Having identified his remains through fingerprint records, the Police concluded the “anti-establishment” anarchist punk, with razor blades hanging from his ears, had acted alone. 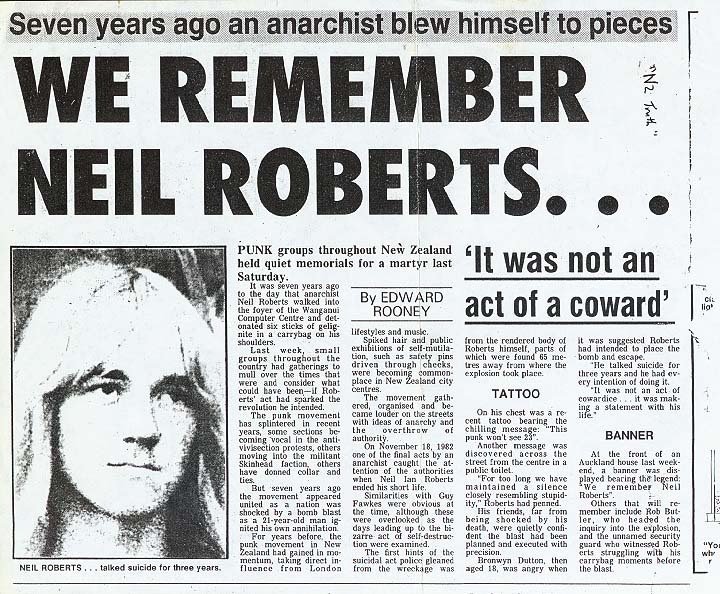 Roberts’ gesture has been commemorated by anarchists and punks each November 18. In 1984 a short art film was made. But after over thirty years, memories of New Zealand’s only suicide bombing are fading. Many don’t even know it happened. However, after the Edward Snowden’s leaks and the discovery of illegal surveillance in New Zealand, carried out on behalf of US agencies targeting Mega Upload founder Kim Dotcom, the event appears to have acquired renewed significance. Roberts even has a commemorative Facebook page. Roberts’ has been characterised variously as a sorry misfit, New Zealand’s Guy Fawkes and more latterly as a terrorist. Police favoured the sorry misfit line. “He had long held antisocial attitudes and was inclined to protests of various kinds,” Detective Senior-Sergeant R L Butler told the press. Those who knew him, though, insisted Roberts was protesting against the Computer Centre because he saw it as a threat to freedom. For Roberts and others, the Wanganui Computer Centre was a symbol of Big Brother. The government of the day had misused surveillance information before, during anti-apartheid protests the previous year. Roberts was a protestor and a punk and in both groups anti-police sentiment was high. In 1977 a new law was passed bolstering the powers of the Security Intelligence Service, New Zealand’s spy agency. Around the same time, the Wanganui Computer Act was passed into law enabling the Centre to be commissioned. One who knew Roberts, a then 18-year-old Bronwyn Dutton, said as soon as she heard about the bombing she knew it was him. “He hated the Computer Centre probably more than anyone,” she said, characterising the bomber as “very gentle, calm, pretty intelligent”. In 1982 virtually no one used a computer. Roberts may never have even seen one. Computers were easy to fear. We are mostly familiar and comfortable with information technology today and value it as a tool for creativity, communications and productivity. But the Snowden leaks give pause for thought. They show we are being watched, we are being recorded and we have been kept in the dark about what our governments have been doing. They also show at least some of that international surveillance was illegal, as it was in New Zealand when targeted at Mega Upload founder Kim Dotcom. After apologising to Dotcom, the New Zealand government corrected its errors by legalising surveillance against citizens and permanent residents, a move that sparked nationwide protests. Now the meanings of Roberts’ action are being reassessed. A new art exhibition, “doublethink” by Ann Shelton, has recreated in sparklers the words Roberts painted on the toilet wall, erecting a series of photographs, one word on each, along the route he took between his home in Taranaki and his target in Wanganui. Ann Shelton's doublethink at Midhurst on the road to Whanganui. The words are a translation from an 1809 proclamation of independence from the Spanish by South America’s first independent government, the Junta Tuitiva in La Paz, in what is now Bolivia. Over two centuries later, Shelton asks questions about the message’s relevance and meaning in 1982 and to us today. The exhibition catalogue (pdf), by curator Meredith Robertshawe, offers a quote from Snowden that seems to eerily echo the graffiti Roberts left behind. Very little was known about Roberts. He was a blank canvas on which others could and continue to write their own meanings. He worked in a restaurant in Auckland before moving to Taranaki. He used the name “Null” rather than Neil. He had a dog called Umbrella that was sent to Auckland by train before Roberts went to Wanganui. In the end, the Computer Centre Roberts hated wasn’t killed by protests or bombs, but by new, more powerful and more ubiquitous technology. The agencies using it were able to set up their own datacentres with vastly more storage capabilities and link these together through high-speed networks. The Wanganui Computer Centre closed in 1995. But the computers keep humming.